Seeds, you keep insisting that things need a reason to exist. That view flies in the face of the reality we observe and experience. Does a sharp boulder exist due to the physical and chemical forces of volcanoes or so that a bear may conveniently scratch its back? You wonder how universes without "stars, planets, and life" can qualify to be called a "universe''. No true Scotsman wears a chastity belt under his kilt. No true universe exists without stars, planets and life? And that is suggestive of a misplaced value judgment in which you seem to be conferring more value upon something because of its physical size (i.e., the material universe) as opposed to the value of the very thing that determines value in the first place (i.e., life, mind, and consciousness). We are all aware of the vastness of the number of planets and galaxies in the universe. And we are also aware of the often-cited reference to how life only appears to exist on just our tiny planet alone. Therefore, from that particular perspective, life’s infinitesimal presence within the context of the abovementioned “5%” is barely worth considering. And when you factor in its presence with respect to the other 95% of the universe you were alluding to, then it (life) is practically non-existent. ...but it also raises the issue of what qualifies it for the title of “universe” and thus membership in an alleged “multiverse”? Yet the proponents of a multiverse seem to believe that the multiverse is comprised of a near infinity of these phenomenonless creatures. Now I know you disagree, but to me, those are simple and valid philosophical questions that cannot be waved-off by making a few anecdotal comments about volcanoes, boulders, and bears. And finally, when it comes to how all of this “flies in the face of the reality we observe and experience,” see my reply to TimeSeeker in my prior post, here - (viewtopic.php?f=23&t=25337&start=135#p381211). Then I will agree to disagree. You cannot imagine any scenario different to what we have. By contrast, I respect the expertise of physicists who suggest that universes containing different mixes of dark energy, dark matter and baryonic matter to our own are theoretically possible. Note that I do not believe that it is so because I have no beliefs in this area, and consider it illogical to do so. Sorry B (and it’s no doubt due to me being thick headed), but I am still having a problem figuring out what your question is. Also, you didn’t seem to give a clear explanation of how (and in what context) rules and eternal truths can exist independent of mind. I'll try again if you will be patient with me. I am citing the teleological cause as appropriate only to living organisms. The eternal good, or eternal truths are not living organisms.Teleological(or final) cause is commonly expressed as 'intention' or 'meaning'. The idea of God as other than eternal good or eternal truths is the idea of God as a living organism. Few people think of God as a great Zebra or a great Bull; most people who think of God as a living organism think of Him as a great Person. ...is all part of the fully-fruitioned “spirit body,” so to speak, of a higher lifeform we are each destined to become like. The point is, Belinda, you are not talking to “most people” right now. No, you are talking to a Panentheistic nut who believes that the entire universe is the literal mind of God, and that God’s self-aware “I AM-ness” and “Personhood” resides within the context of the central consciousness that is metaphorically depicted in my fanciful illustration. I am talking about a living central consciousness that possesses ownership and control over the fabric of the universe in precisely the same way that our own central consciousness possesses ownership and control over the fabric of our thoughts and dreams. Furthermore, the “Personhood” of God is neither a “Him” nor a “Her” (nor an “It,” for that matter), but is something wholly different - something of which our human pronouns are incapable of labeling (something that also applies to the souls of the seeds). Now I am not even remotely assuming or suggesting that my wild and speculative theories can’t be wrong. However, it is pretty obvious that when it comes to the definition of the word “Person,” you and I aren’t even standing in the same ballpark. My contention is that the idea of God as a great Person Who intends this or that is an inadequate idea which does not even have the dignity of the best of human reasoning. And that is precisely what a “seed” from the above illustration would say. Worse, the idea of God as a great Person permits men to oppress other men, and permits lazy thinkers to push their responsibilities for this Earth and its inhabitants on to a deity. Hence my constant harping for the need of a new “material/spiritual paradigm” to replace the old one. The multiverse is an example of a theory which men reason about with no reference to a God Who is a great Person. However it's possible to reason that there be eternal truths such as for instance mathematics. No, the multiverse is an example of a theory that men (again, unconscious “seeds”) use in the hope of ruling-out the need for God. And when it comes to the alleged eternal truth of mathematics, I have yet to witness a plausible theory that clearly explains how mathematics (on its own blind and unconscious accord) could somehow grasp the fabric of reality and shape it into a context of order that defies comprehension. My dilemma was being completely unable to read the small, blurry type even when I put the image in Photoshop and enlarged and sharpened. Where did you gain this information and how can you be so sure that you are right and almost everyone else is wrong? So we are the dream of the central consciousness of reality? A strange dream that so carefully follows laws of cause and effect, though. Math has never claimed to be "eternal truth". It is a tool and a language, not a doctrine. In fact, practitioners of pure mathematics make clear that their discipline is unrelated to reality and there is every chance that their models will never find a physical analogue, and will remain only abstract entities. However, from time to time a model devised purely from the math for the fascination of it ends up being useful: https://math.stackexchange.com/question ... ing-useful and correlating with patterns found in reality. Meanwhile, applied maths predicted black holes, which was an extraordinary achievement. Increasingly as our instruments come up against physical limits (eg. it would be impossible to build a collider large enough to reveal theoretical Planck scale entities) then the next step of exploration needs to be math. 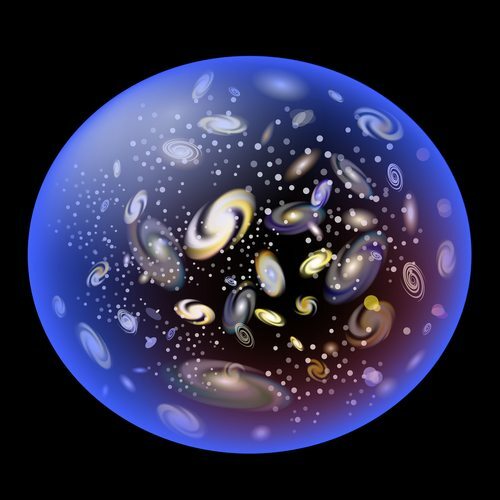 The universe/multiverse question is just one of probably many areas of inquiry that will in time have to shift from experiment and observation to calculation. What do the words 'Universe' and 'multiverse' mean? If the word 'Universe' means all-there-is, everything, the whole, et cetera. If 'uni' originated from or means one, and, 'verse' originated from or means turned,, et cetera, then with the turning, or combining, of every thing into one whole, then 'Uni-verse' would literally mean absolutely every thing as a one whole. Obviously there can not be any thing more than the One whole. If the word 'multiverse' means more than One universe, then that would be a contradiction of terms. The 'uni' in 'universe' makes that term mean One, only. If a person wants to suggest that there is more than one, many, or multi 'verses', then what do they mean when they use this term. Also, after they define that, of which they have then obviously shown and proven how there are "multiverses", i personally would then question them in regards to what word are they now going to use that now means Everything as the One whole? What is the term now to used that has the definition of ALL of these "multi-verses" together as One? What will be the effect of now turning all of these now new verses and combining them into One whole thing? In other words what will be the new terminology we now use for A One whole thing? 'Uni-verse' worked perfectly as a description before. To me it seems a rather pointless exercise all round. Also, and as others have already pointed out, WHERE are the separating factors of these supposed different 'verses' and WHAT are the distinguishing factors exactly between so called different multi-verses? (For a clearer view of the dialogue, click here: http://theultimateseeds.com/Images/48%20page%2077.jpg and then click on the image to expand it.) - which goes to my website. you are talking to a Panentheistic nut who believes that the entire universe is the literal mind of God, and that God’s self-aware “I AM-ness” and “Personhood” resides within the context of the central consciousness that is metaphorically depicted in my fanciful illustration. Central consciousness is unimaginable except as an analogy with biological central nervous system. If this analogy helps you Seeds, good and well, however it doesn't help me because the new and reasonable religion which we need is not based on biological metaphors but on the biosphere itself. Religions are no use to man or beast unless they are instrumental in sustaining life.This is only universe we can know. I provided a link to that very same video over a year ago in the “Does Consciousness Cause Quantum Collapse” thread. Max Tegmark wrote: Before we talk about other universes – parallel universes – let’s remind ourselves what we mean by our universe. Our universe does not mean everything that exists; it simply means the part of space from which light has had time to reach us so far during the 13.8 billion years since our Big Bang. He then goes on to imply that what we call “our universe” merely consists of everything we can see at this particular moment, and that in the same way we still cannot see the furthest galaxies that surely exist, likewise, there may be other universes out there in space that we simply cannot see. Looking at the universe from the perspective of the “Big Bang,” it allegedly begins with a tiny “speck” of unimaginably dense matter that, approximately 13.8 billion years ago, began to expand in an outward and omnidirectional thrust of its contents. It is an image that poses all of the suns, planets, and galaxies as being contained within a “bubble-like” phenomenon whose outer “film” (the bubble’s delineated boundary) is a light barrier of which none of the bubble’s interior contents can ever move beyond (at least nothing that exists within the context of what physicists call “local” reality). The point is that regardless of us not being able to see the furthest galaxies, we can still theoretically infer (by reason of the Big Bang theory) the existence of an all-encompassing end-point to our universe (as is depicted in the illustration). Now I am not questioning his prowess as a physicist, however, if Tegmark is so lax in visualizing the implications of the Big Bang theory as it applies to defining the boundary and seeming totality of “our universe,” then where else is his imagination failing him?